Happy Christmas Eve, to all who celebrate it. I know I said last week I’d have a bonus one-shot Christmas comic today, but I’m afraid I couldn’t get it finished for today. So I’ll finish it tonight and post it on Christmas tomorrow, and make this a three-update week. There may be more shoes stabbed into drywall in the future. This is the very first time I liked Andi, or “got” her at all. I totally laughed at her getting an idea from the shoe; oh Andi, you artist! Also, got to say Alexis is being… erm… difficult. Guess the laws of small casting do not apply. Good to know. Wait, this is taking place on August 23? They started school that early in the season? I agree that it’s really early for being three weeks into the school year. It also means the stock of cold weather heating pads was bought WAY in advance. On another note, I’m glad to know Andi is not Alexis’ sister. Back in high school, we started the first Wednesday of August. Most schools around me (southern Alabama) started that early, so perhaps it’s a regional thing? Yes but the spring season ends a little earlier than usual. Oh look, they live in the same building. My, what a “small world” trope. Damn, beat me to the punch. Was gonna say that. I suppose I could go back and rework this to fit the “Andi is Alexis’ Sister” theory? I was going to say we can play some really easy games of six degrees of separation with this. Or what more we could get the ultimate twist and learn that their whole ‘world’ is like a hunk of land trapped in a fish bowl and Selkie’s people actually rule the world. …Yeah I can dream. Kind of a Truman Show or Yu+Me: Dream game changer twist? *Jessie is Todd sister, who was born and put up for adoption after he was. *At some point approximately 10 years ago, Todd was low on cash so he sold his sperm to the sperm bank. Somehow, unknowingly, he is the biological father of Sandy, Wu, George, Heather AND Keisha in addition to Amanda. *The Merman doctor who we saw during Andi’s phone call was actually Selkie’s father, and was the doctor who assisted in the delivery of Amanda. *The African American woman who works at the orphanage is biologically Todd’s father’s sister. The other woman who works at the orphanage is Todd’s father’s great-great-grandmother. (She is secretly an elf that has lived for 1,000 years). *Everyone who works at the Shoe-store where Selkie got her shoes are also elves, and they are relatives of the elf at the orphanage. 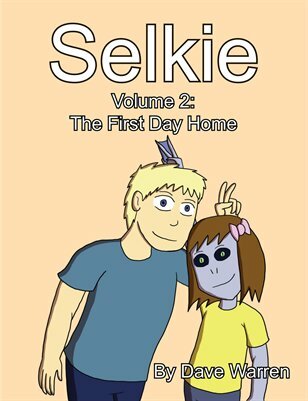 *Selkie’s PE teacher and Heather’s adopted father are genetically altered clones of Todd created by the military. The project was canceled, but it’s intention was to create soldiers to invade the mer-city that Selkie came from. aaaaand that’s one more fan theory disproven! Well, now we know the sister with the ex-boyfriend “trying to worm his way back into her life” in page 121 wasn’t Andi. Which I’m glad for. It wouldn’t speak well of Andi if that’s how she spun/interpreted Tod finally returning her calls with a reluctant heads-up. …. although based on Alexis’s behavior, who’s to say how she would have described such a situation. BUT that’s all just a hypothetical. Alexis is expecting with the “I’ll be at my sister’s” line. The only nitpick I’d have is that the timing on this feels a little “off” to me. locate Amanda, took place during the “shirt” incident at Selkie’s school. Not weird. Artists have MANY ideas that occur spontaneously from surroundings. This could be her main method of being able to recall them. I can’t remember most of my best thoughts because of not having such a device, and I’m not an artist but I’ve had friends who were (a problem of getting older). I used to be horrible at remembering things. When I finally owned up to it I bought a planner, and later a smartphone. Andi’s just finding a workaround to her problem, and a great one too… that is if she’s anything like me.